Sue Minter speaks at Sen. Bernie Sanders' Super Tuesday rally in Essex. 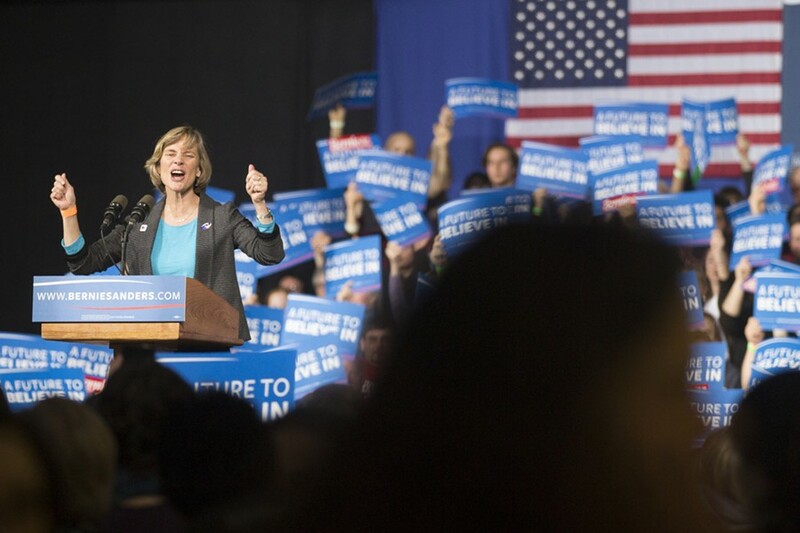 For much of the Democratic presidential primary, Vermont gubernatorial candidate Sue Minter shied away from issuing a full-throated endorsement of either former secretary of state Hillary Clinton or Sen. Bernie Sanders (I-Vt.). Her hesitance was understandable. Many of Minter's top allies — including EMILY's List, whose support she was courting at the time — were squarely in Clinton's camp. Sanders, however, was the home-state senator and the choice of most Vermont Democrats whose votes she will need in August. In an interview two weeks ago with WCAX's Kyle Midura, Minter disclosed that she was leaning toward voting for Sanders, saying, "I believe Bernie, uh, is going to be my candidate." But she declined to offer an explicit endorsement, explaining that she was focused on running her own campaign. "Who I vote for is my business, but since you asked, I will let you know," she told Midura. So it came as a surprise when Minter took the stage Tuesday at Sanders' election night rally in Essex and delivered a passionate speech calling on his supporters to "keep the fire Bern-ing." "I'm here to tell you that I am so happy to be here tonight to support my senator, your senator, our senator, the next president of the United States!" she yelled to a crowd of roughly 4,000 potential voters. Minter's Democratic rival, former state senator Matt Dunne, was more than surprised. Dunne endorsed Sanders last October, knocked on doors on his behalf in New Hampshire and phone-banked for him in Vermont. "It was disappointing to see Sue endorsing as late as she did, when she could have had more of an impact had she endorsed days or weeks sooner," Dunne's campaign manager, Nick Charyk, said Wednesday. According to Charyk, the Sanders campaign asked Dunne last weekend to introduce the presidential candidate at his Super Tuesday celebration. On the morning of the rally, Charyk learned that "there was a small change in the program" because Minter had asked to speak, too. "I said, 'I'm a little taken aback by that because it was my understanding that Sue was not endorsing Bernie, even when explicitly asked: Are you endorsing Bernie?'" Charyk said. "The Sanders campaign told me Sue had talked to them and planned on issuing a press statement that day endorsing him and would be speaking at the rally." In an interview Wednesday, Minter claimed she had endorsed Sanders long ago. "I have been 100 percent behind Bernie, said I was voting for him, supporting him and, yes, endorsing him," she said. "Bernie is my hero. I have worked closely with him. I am fully in support of Bernie and have been, just as I've been saying for weeks." So why did Minter tell Midura she was voting for Sanders but not formally endorsing him? "What Kyle put up didn't include all of the reasons why I'm supporting Bernie," she explained. "And I think he made some kind of big distinction." But the day after Minter spoke to Midura, Seven Days' Terri Hallenbeck asked the gubernatorial candidate why she was differentiating between voting for Sanders and endorsing him. "I've been focused on my race," Minter said. "I've been focused on being the next governor — and knowing that the next governor has to have a strong working relationship with the next president." The first real evidence of an endorsement came just four hours before Vermont's polls closed Tuesday, when Minter's campaign sent a press release to some members of the media that said, "Today Democratic Candidate Sue Minter announced her endorsement of Bernie Sanders for President." Seven Days reporters, who are on Minter's press list, did not receive a copy. Why, if Minter had endorsed Sanders so long ago, did she wait until Election Day to announce it? "Because there was some confusion about whether I was, in fact, endorsing him, so I wanted to make it very clear," she explained. Did the Sanders campaign, as Charyk intimated, ask her to issue the formal endorsement before giving her a speaking slot Tuesday night? Seven Days put that question to Minter five times Wednesday, and each time she declined to answer it, returning instead to her talking points. "I put out a statement so that people would know exactly that I supported and endorsed and am voting for Bernie Sanders," she said, repeating the non-answer several times. Minter's campaign manager, Molly Ritner, also wouldn't say whether the Sanders campaign had pressed for a formal endorsement. "This game Matt Dunne is trying to play of 'who endorsed first' is silly and insulting to Vermonters," Ritner said in an email. "The press release was a formality. While we'd been public and vocal of our support for Bernie for several weeks, there was nothing 'official' in writing."